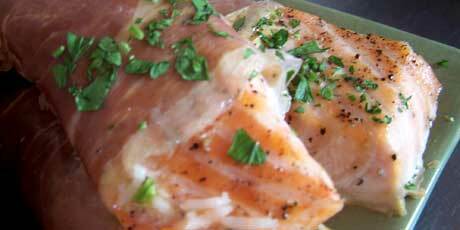 Gorgeous salmon wrapped in a thin slice of prosciutto and baked to perfection. 1. Preheat your oven to 375°F. Season the salmon filets to taste with salt and pepper. Spread some mustard on each filet. Tightly roll each filet in a slice of prosciutto. The ends of the salmon will protrude beyond the prosciutto. Place on a baking pan, seam side down. Bake for 15 to 20 minutes.